Direct strategy and development, from start-up to IPO, for developers of the GeneChip genetic analysis system. Cutting-edge web site supporting strategic corporate goals. "In three years of working together, Foley & Associates has never failed to deliver quality projects on time. Their responsiveness has enabled us to develop and maintain a dynamic, well-orchestrated site. 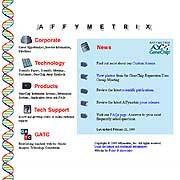 "—Leanne Vennemeyer, Marcomm Manager, Affymetrix, Inc.